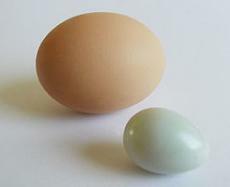 A lovely blue quail egg next to its larger cousin, the chicken egg. Learn about the different types of eggs at TheNibble.com. June 3rd is National Egg Day, and an opportunity to expand our horizons. Quail eggs are small and beautifully speckled in blue and brown. They make a spectacular first course or salad course, hard-boiled and nestled at the front of a lightly-dressed mesclun salad (set 3 eggs in a lettuce leaf “cup”). Check locally for quail eggs or search for them online. Boil the eggs for 5 minutes with a teaspoon of vinegar, and serve them warm or at room temperature in the shell. Provide ramekins of salt water so diners can simultaneously rinse and salt their eggs after they’ve peeled them. Snip some fresh herbs (chives, parsley, dill) into the salad, and you have an exciting dish that takes very little time to make. For more salad ideas, head over to THE NIBBLE’s Vegetables & Salad section.